My first remembrance of this mystical island was the Byzantine chants drifting on Sunday morning through my open window on the edge of the caldera. The chanting Greek priests in the Cathedral of Thera set the bar high for further Santorini experience. Several visits in the coming years proved that a surprise was welcomed around every corner on those September island vacations. A very fond encounter, on one hectic noontime visit in the village of Thera, made friends for life with Yannis and his mother, Ruella. The touristic streets and paths in the center of Thera were filled with the Cruise Ship visitors, yet the littlest shop under the steps near the postoffice proved to be the perfect refuge. It was the strumming guitar and the humming to a Greek fisherman’s song that drew me in to sit and listen. Captain John, Yannis’ friend, put down the guitar and we all greeted each other. The postcards, lottery tickets and the aging souvenirs on dusty long forgotten shelves were behind Yannis. His diploma of Notary and the religious icon art on the walls, and the stacks of documents in organized piles proved the 60-year-old man was more than perceived. 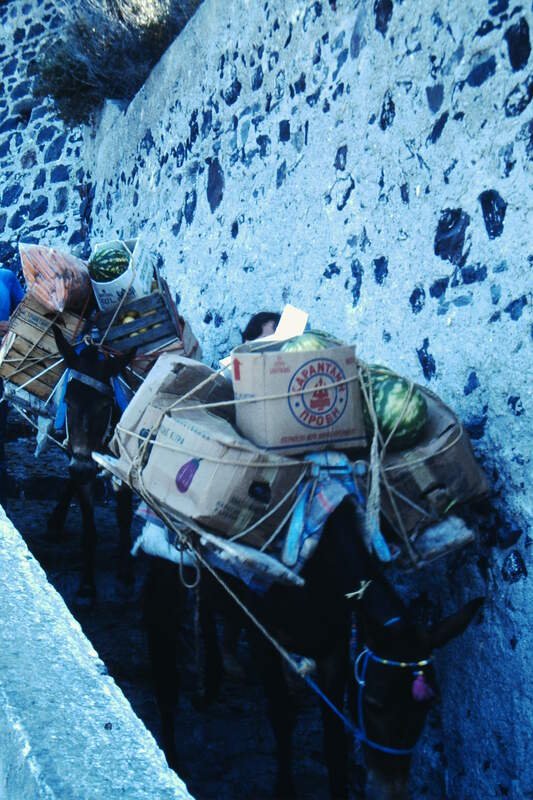 Yannis lived on Santorini his entire life. He and mother, Ruella, perhaps at age 80, lived steps away in the vine-draped whitewashed house, situated on a narrow path in a Greek courtyard. A rusted and dented Vespa motor scooter gave Yannis his mobility. The shop was alway open. The full white beard and the stock of white flowing locks contrasted with the well tanned face and arms on his near five foot frame. St. Nicholas in khaki shirt and pants was more of the total vision of his appearance. Yannis spoke english, though a nod and the Greek expression, “Nai” or yes, always with a smile, made most conversation flow. The visitors to the shop were steady and regulars of local commerce, some farmers, fishermen and several realtors. In island government, Yannis made the official transactions happen. He knew them all. 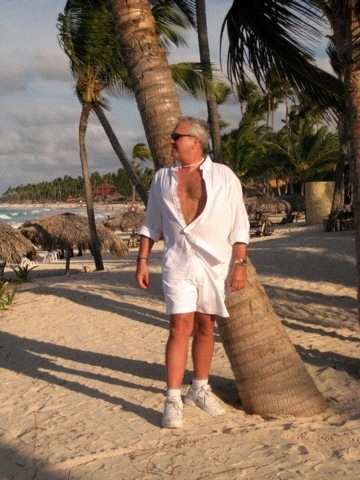 Captain John, the guitarist, but also island real estate developer, was a fine friend. In fact, Yannis had dozens of very close friends, very few local family members, and was a life-long bachelor. 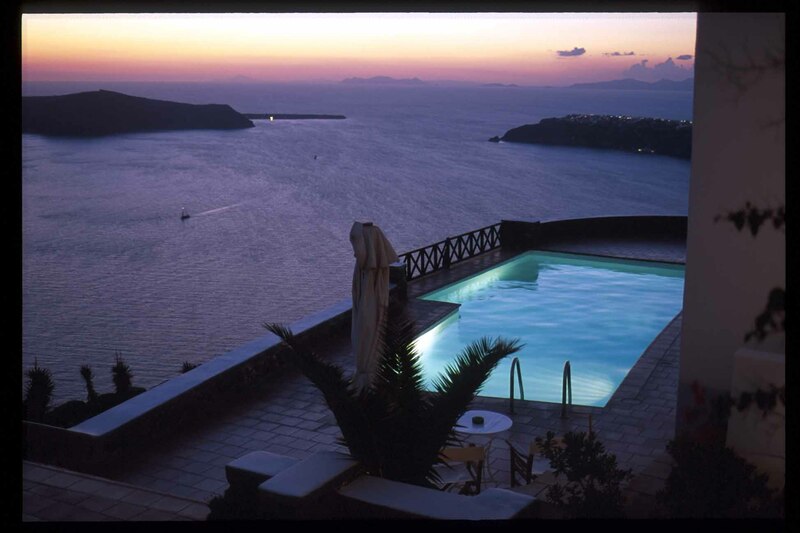 The ability as an outsider to be humbled with acceptance into the home of a proud and stoic traditional family on Santorini is very special. The thongs of tourists and day trippers that come to this speck in the Aegean Sea, an angelic perch above the crater of a still active volcano, dominate a very short island season. The year-round families and businesses endure for the considerable “off-season”, in an isolated and protective life. Ruella, on her four and one half-foot height, and dressed for decades in her widow’s black, maintained a simple house. Discarded olive oil tins hang filled with fresh herbs, amongst the red bougainvillea flowers that climb the front porch. Cats sit on the stoop and canaries sing in the wire hanging cages in and out of the house. Cycladic dark cedar furniture, linens and religious icons fill the house. The china cabinet and several fine porcelain vases fill the one wall with the photograph of Ruella’s second son, Father Vlavianos, the Greek Orthodox Arch Bishop in Chicago, IL, USA. 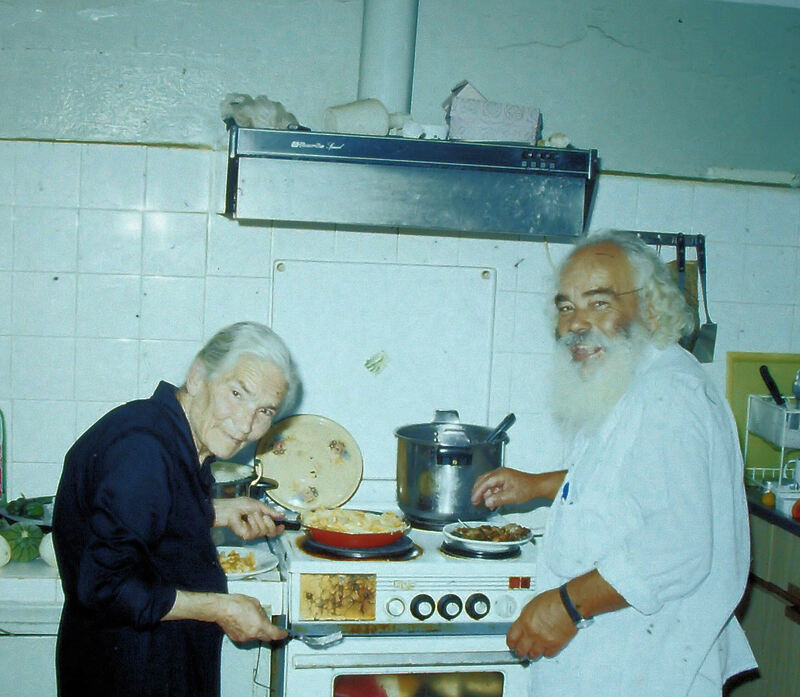 The invitation to eat dinner and join with Captain John, at their home with Ruella to cook was easy to accept. I love all Greek food. 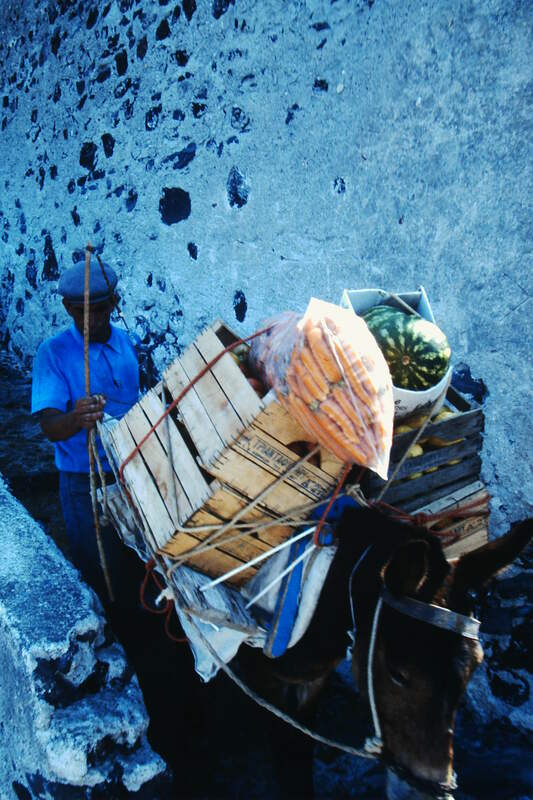 I will try anything, yet, much of the local foods of Santorini are imported, with exception of produce and some fishing. Yannis’ household was all natural: locally caught, locally grown, and most importantly locally pressed and bottled! The night began with a dram of raki. The distilled spirit had a tendril of fennel immersed in the thick bottomed aged glass wine bottle. It was potent and hot on the throat, made to open the senses. Yiamas was the toast to our health. Soon Ruella’s icebox was opened to produce the dark green unlabeled wine bottle from Yannis’ vineyard. Yannis proudly talked about his father and grandfather’s grape vines. 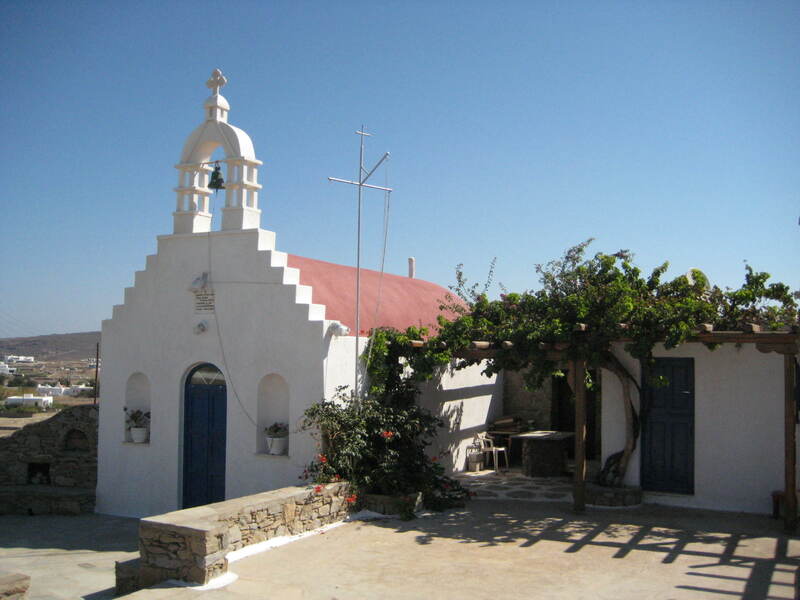 Several acres on a track of land toward the caldera road to the Village of Pyrgos is the location of the vineyard. The soil is ocher, appears very dry, contains one small cinderblock tin roofed structure and a wire fence encircles it with one gate. Tourbuses on way to Akrotiri rumble past this nondiscript location without fanfare. The grapes are white Assyrtiko and Athiri. The rows of Yannis’ grapes are non existent, as the land is planted in clusters. The vine stems are now ancient and five-inch base stems throw off the vines each year in the volcanic soil of Santorini. The morning air is rich in moisture up from the sea far below in the crater. The heat of midday pulls the sugars up into the grapes. Very little rain in the summer and fall months requires the porous subsoil to give up the winter deposits from deep below the surface. These characteristics make a dry, citrus aroma, hinting of salt, acidic full-bodied wine. Yannis explained the family church. Most older family landowners retain a small church on their property. 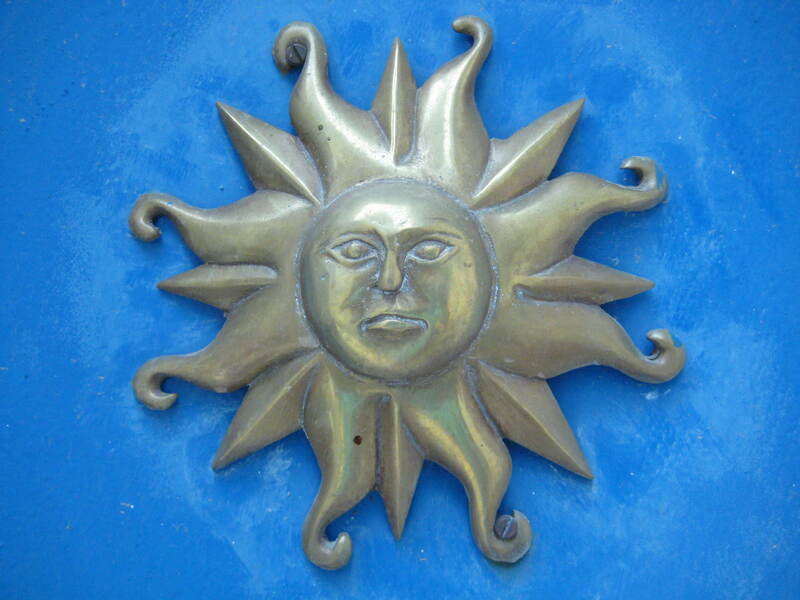 It is used for religious events from year to year and maintained with the proper icons and candles and offerings. 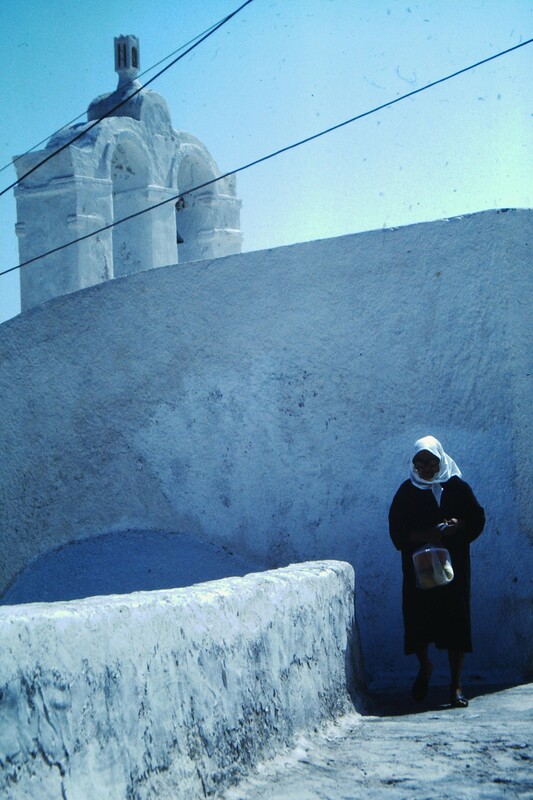 Yannis takes the harvested September grapes to his church and spreads them to air dry on the stone pavement adjoining the church for ten to 14 days. Covered with gauze to protect from birds, they mellow and concentrate the sugars ready for pressing. Soon the grapes are brought to a local press and filtered and barreled. They are stored near the church and some are bottled. The dinner was wonderful. The start became a hit as a filefish was baked in garlic and olive oil and the crusty local bread combined well. 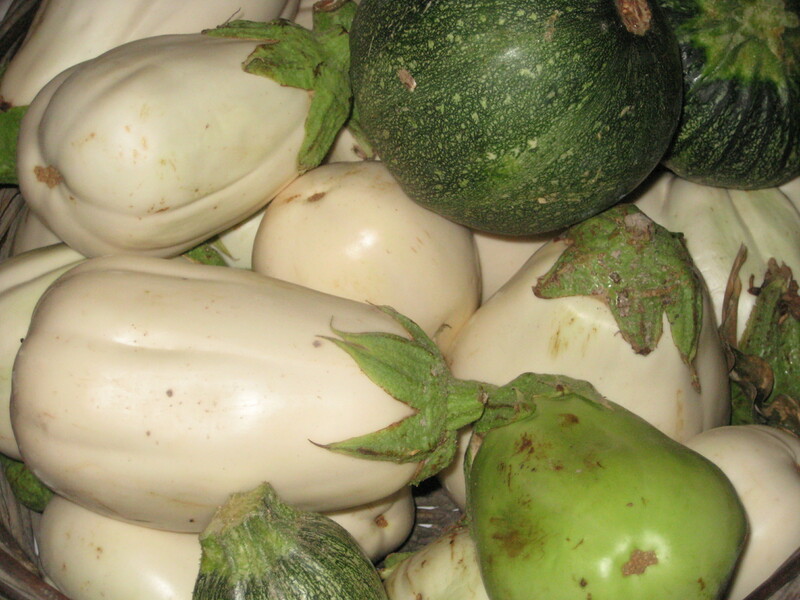 Ruella grows the special baby white eggplant, unique to the island. These were sliced into discs and fried in light egg and flour batter. The finish was the morning harvested local rooster, baked on Greek oregano stems, and feta cheese cubes over warm slices. Horta greens were bathed in lemon juice, salt and olive oil. The desert was local pastry shop, daily baked, sweets. The local made wine was two years in the process and paired perfectly with the food. It was a couple of percentages more in alcohol, but refreshing to taste. The night went a bit longer that imagined. We all laughed and Captain John played more guitar. When September comes the vineyard owner must act. Three days after the dinner we went to the vines. The time was right. Yannis opened the little structure, we took wicker baskets, hook-shaped paring knives and we headed to the closer grapes. The vines are twisted into wreath like circles. Inspecting the grape bunches was a shocking treat. Those nearer the ground were so robust in swollen juice, that each grape pressed against its neighbor into a cubic block of grape bunch. A flick of the wrist and the block fell into the wicker, then on to the next. Several baskets finished the task. At noon, the work was, well, hard. A breeze was blowing off the lip of the crater’s edge. We transferred all to the little church, said a prayer, and had a sip of last years wine out of a plastic liter jug, a little warm but alright. All was perfect to finish a great day. I am certain the grapes seasoned and were pressed into a fine batch. Yannis was a perfect host this visit. Yannis hopped onto his Vespa and had plenty of people looking for him back at his little shop. 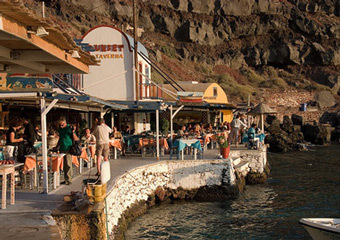 The restaurants on Santorini are supplied by several commercial wineries. A carafe at a favorite taverna is the way to go. 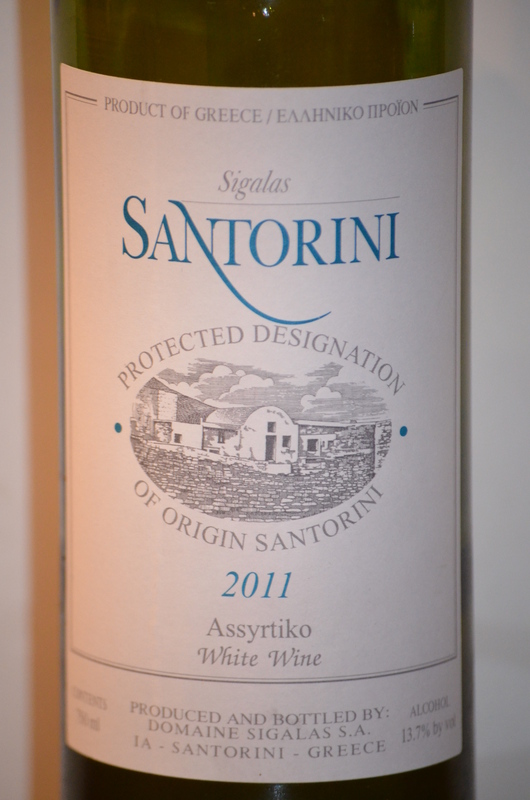 I especially like the dry wines of Santos Winery, and Boutari assyrtiko white is readily available away from Greece. Prices have risen some over the years but the cost is worth the pleasure. The desire is simple: hop on a little comfortable vessel, have a coffee in a roomy armchair, watch the scenery whizz by, and dock next to pure bliss. These are the beginnings to a fulfilling getaway on the island of Hydra, Greece. The spring months open the tiny Aegean Islands to the tourist trade and Hydra, a mere hour and one half sea trek from Athens, is well prepared for international visitors and savvy Greeks. 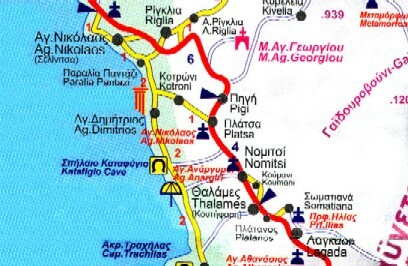 The draw to the several square kilometer parcel a short distance off the coast of Greece’s Peloponnese is twofold: no motorized vehicles and a comfort oriented infrastructure. The Port of Hydra is bustling with action, as the visitors make their way over cobblestone whitewashed paths to the numerous guesthouses and very small hotels. Want a taxi? 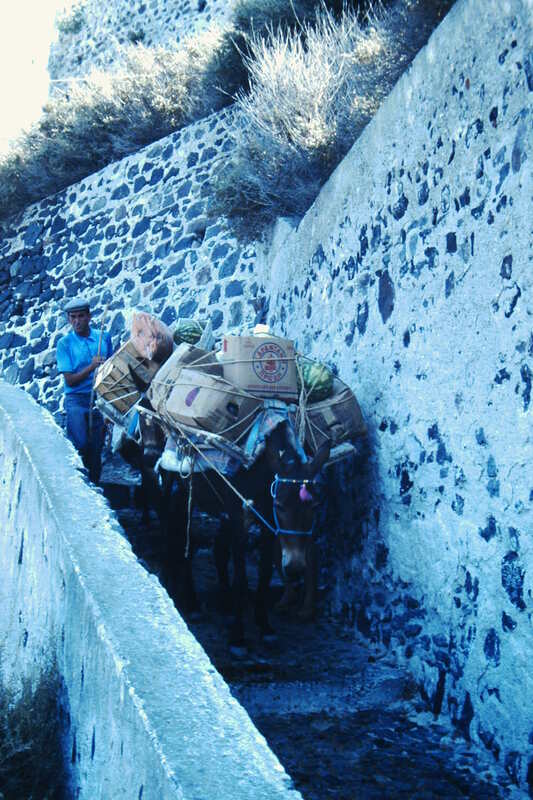 Grab a Mule and driver to move you and luggage to the comforts of your Bed and Breakfast perched over the harbor slopes. 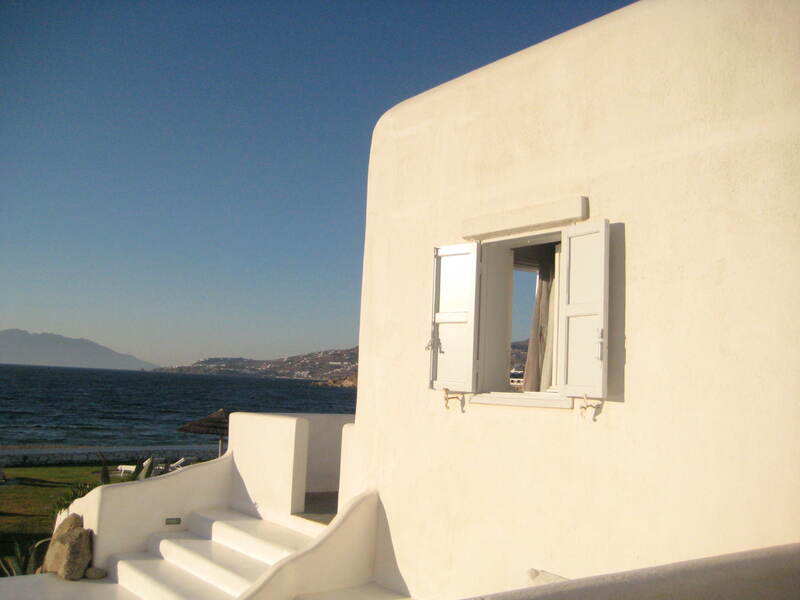 A breeze is alway found in the town from the western direction and the mountainous southern peninsula of Greece. The local sea is regularly calm and commercial trade moves on it between the mainland, the port and several little villages. Caiques can be hired to move the tourist from the harbor to several picturesque coves. Beaches abound, though some are pebbles, and others have amenities of tavernas and changing facilities, and chaises and umbrellas. The network of pedestrian pathways lace the seaside and countryside and make casual walks very easy and true hiking objectives very manageable. Wild hare stiffado, baby lamb chops, braised field green in lemon, pistachio ice cream, washed down by carafe upon carafe of white wine from the courtyard’s oaken barrel is a start. 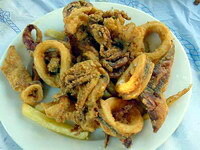 The locals know the seasonal foods and the several great little restaurants accommodate, as all are quite good, Seafood is alway available and a mullet or seabass grilled in olive oil and Greek oregano, bathed in lemon juice, surrounded by crispy chips is a best choice. Christina’s Taverna is an outdoor courtyard leader and Hilda, owner at the Phaedra Hotel will point you in the right direction for the best daily activities and nighttime dinners to your liking. The morning meal is perfect on their rooftop plaza and the comfortable rooms add to the pleasure. My fondest pleasure is the morning wake up call; well, not a call, but the sound of the “clop-clop” of the Donkeys on the cobblestone village path. Out of the canopy double bed and up to the balcony for a Greek coffee got my day going just fine. No mopeds, no SUVs, no tour buses, all kept the day perfectly aligned. 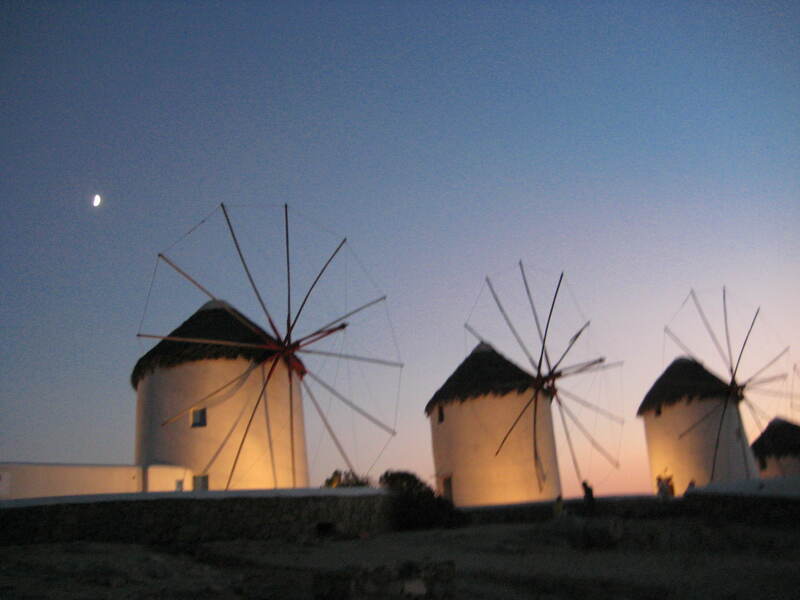 Vacationing on Mykonos is a 9 to 5 Job: Nine in the Morning to Five in the Morning! I love every hour of it, and have for summers for about twenty-five plus years. Yes, I have the routine down pat. You really need to stay on the island for several days minimum to get the rhythm and fall into a hypnotic state. I drink in the hours into their own zone of continuity. Mornings are leisurely, breakfast is light, Photo opps prevail. 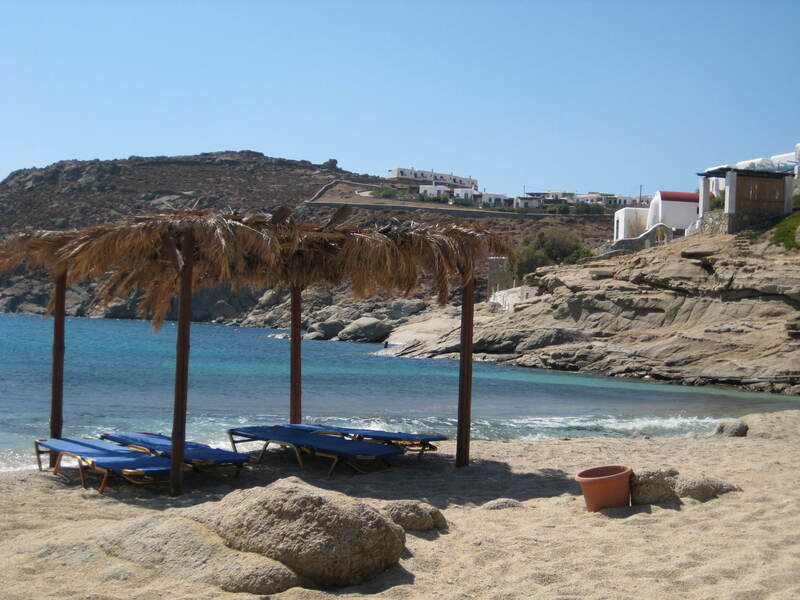 Noon is the time to mobilize to the beach, Paradise or Super Paradise or out past Ano Mera Town to a secluded cove. Taverna food on the beach fits in somewhere. High Five Hour is for partying on the beach bar [ literally, standing on the bar to the euro disco beat]. The sunset brings its joy. Nap time back at the Villa. Then the rest is open. Dinner out in Mykonos town. Then to the clubs. Five A. M. comes around darn fast. Repeat all above as often as necessary. 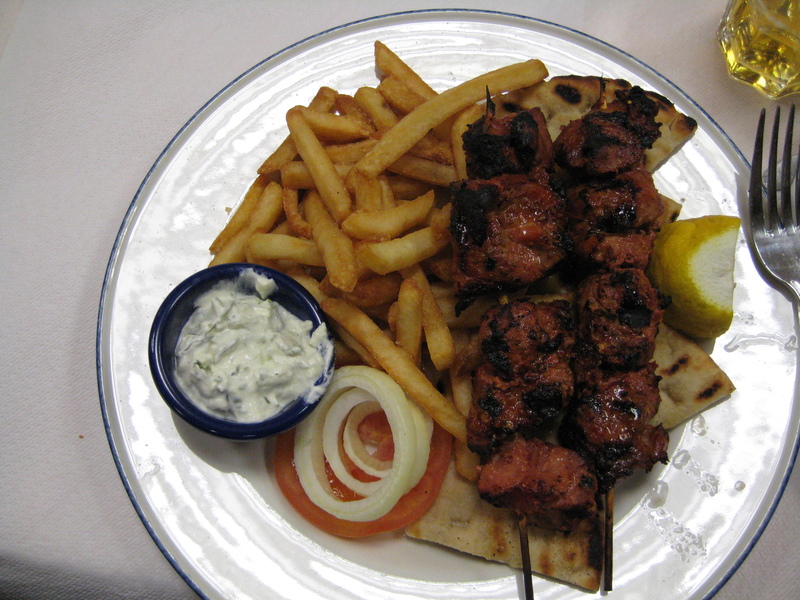 Some of the tastiest world cuisine is offered from the Athens hole in the wall establishments. 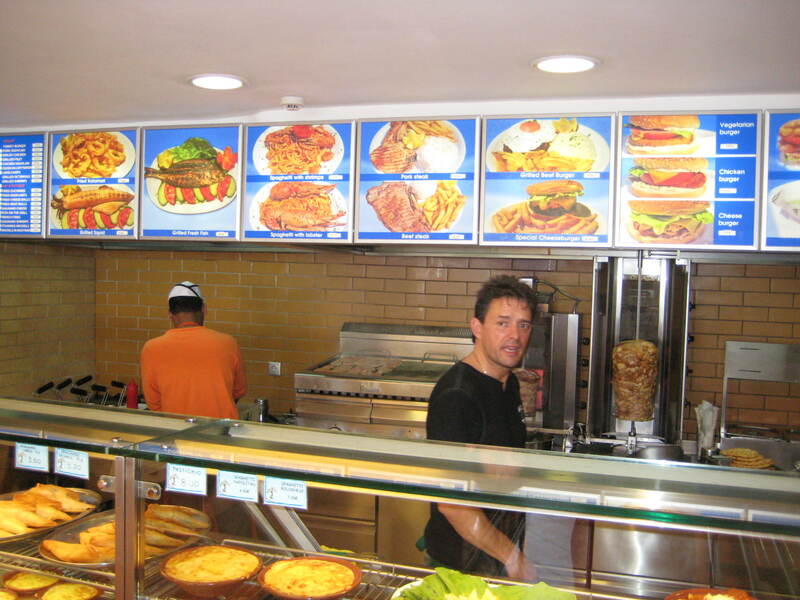 Though, not off the beaten track, the Souvlaki and Gyros stands in the neighborhoods of Athens draw the regulars and the tourists for the right foods at the best times. Value and flavor blend together into a frenzy of activity at the lunch hour and then at two A.M. nightly. Taxi drivers have their special spots. One only needs to search for the cue and the triple parked vehicles to get a resource. Behind the counter two or three fellows with short -sleeved white shirts and short white apron silently scurry and fulfill the the stream of fast moving food orders. The Monastiraki District, just past the Plaka, below the Acropolis in Athens is the place to get started on this food quest. Of course, more sandwiches and sweets are offered at these small walk-up food shops. Perhaps juices and sodas, coffees and frapuchinos are delivered to the diners. Yet most stick to the specially of the house. Sadziki on the griddle seared Pitta bread, that is a bit more spongier than the Lebonnese style, is the building block for the sandwich. Thinly sliced onions, small cubed ripe tomatoes, and the open fire grilled seasoned pork cubes almost finish the dish. Then you may be asked, potatoes? Say yes. The savory olive oil fried French fries blanket the Pitta and all are rolled into a perfect waxed-papered and aluminum-foiled Souvlaki sandwich. Where are these? You may ask each Taxi driver. In his cab, you may drive a dozen blocks away. Stick to my area. Thanasis on Metropoleos street by Monastiraki. Platia Iroon in Psiri ( This is one of my favorite nightly districts and near all.) Kostas on Agia Irini Square next to the church of the same name on Aeolou Street. Ap’ ola means “with everything”. Two sandwiches are just right and costs Four Euros total. Cheap when you aquire a Mythos or Heiniken beer to wash it down. It always works for me at Two A.M.! The vision is clear: Vathia, Greece in the Laconian Prefecture region of the Peloponnese, is etched in time long forgotten. 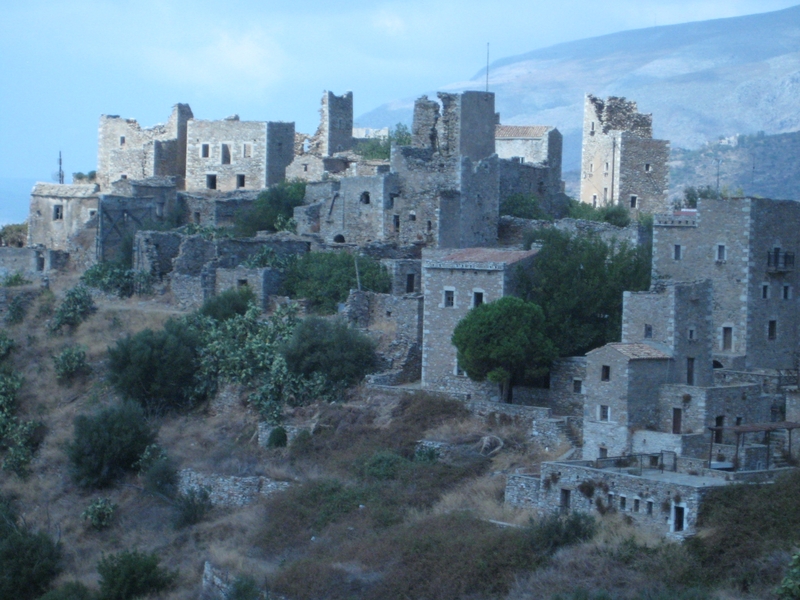 This village is perched atop a 600 meter high foothill near a 1200 meter high mountain only 10 km from the absolute southern end of the mainland of Greece. It is truly the last real outpost. 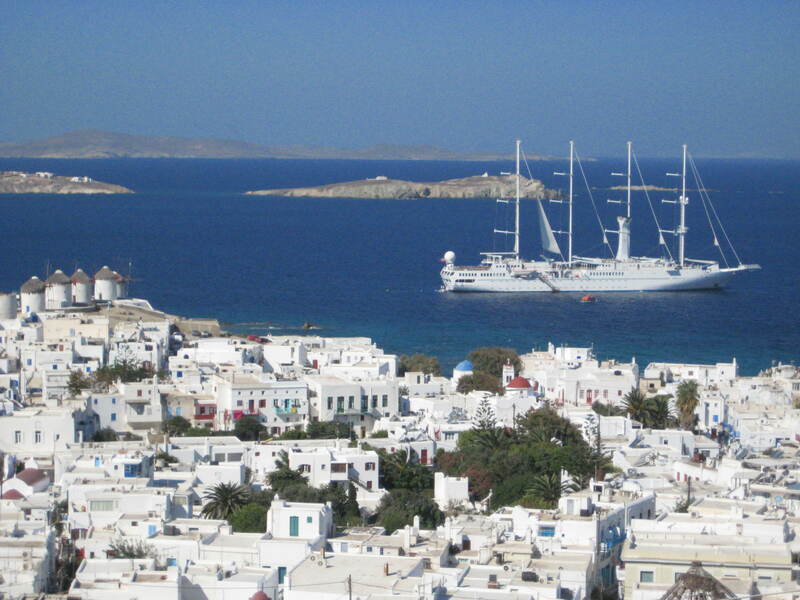 Beyond lies the inky blue Aegean Sea, the idyllic islands of the Cyclades and Crete, then Africa. Ancient mariners knew this region and the Shoals and impenetrable cliffs down to the sea. It seems all that tried to conquer this land came up short. Why is that? Mani, of course. 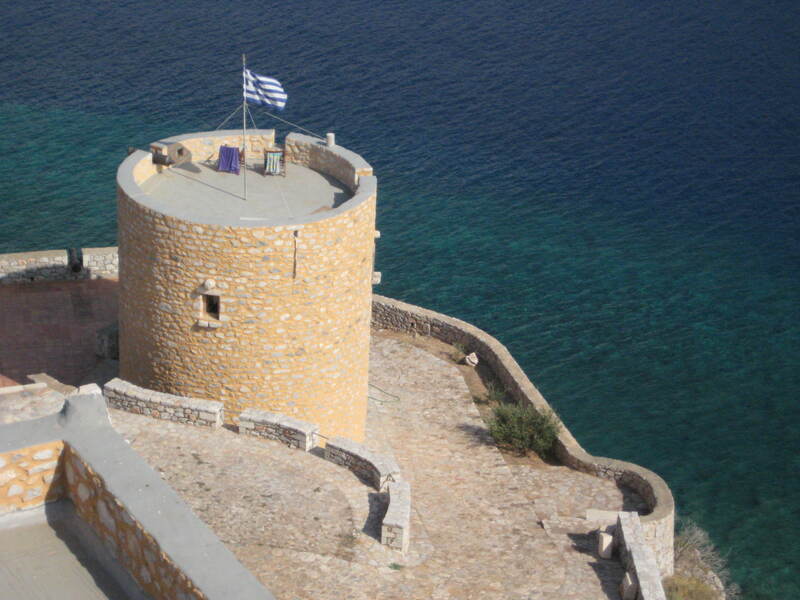 This is the Mani territory of Greece. Fierce fighters, fierce women, fierce families, stamina of iron, will to endure generations of Mani tenacity. So, this village is made of Mani and the architecture is of Mani. The surrounding hills produce the rock and the builders understood the best use in their fortresses, homes and churches. The Mani home is a fortress. The cubes of chiseled stone blocks rise three, four or five levels. Perched on the edge of cliffs, outcrops of gorges or hanging over the sea, these structures are rugged as castles. The windows begin on the second level, hence protection from the marauders of the past. Vathia is on the southern Aeropoli highway. It is 10 km past the turn toward the Caves of Diros. The switch backs in this two lane road gyrate amongst the olive trees. Groves rise on the foothills. Stark crevasses scar the cliffs. The village looms above. Lighting and shadow play here in unique combination. The last switch back finds the narrow plateau of Vathia. The structures date back over 300 years. One road passes through; the other paths are for mules or folks. The census is unclear; maybe 150 residents? I believe less. There is little commerce here: a bed and breakfast, a little taverna (not open now). There are lazy dog(s), I saw one. The village is pretty sleepy. There is an active church. Several towers are vacant. Some are in disrepair and open to the elements. “For sale” appears on a few buildings. Mani homes are hard to comprehend. They just don’t look lived in. The meandering paths open the courtyards and the Flora to the visitor. Vines and flowers, fruits and pottery are all over. On a balcony leans a black shawled senior Mani woman keeping watchful eye. Below are only the cats: Mani cats. They are fierce Mani cats. She is watchful, though. Little else moves. The photo opps abound. The adjacent view back toward the village, from the lip of the road, presents the light of the day in the best angle. Few are on the highway. Little activity is out on this last stretch of road during the waining summer’s end of September. The temps are great, sun is high and the nights are clear and brisk. 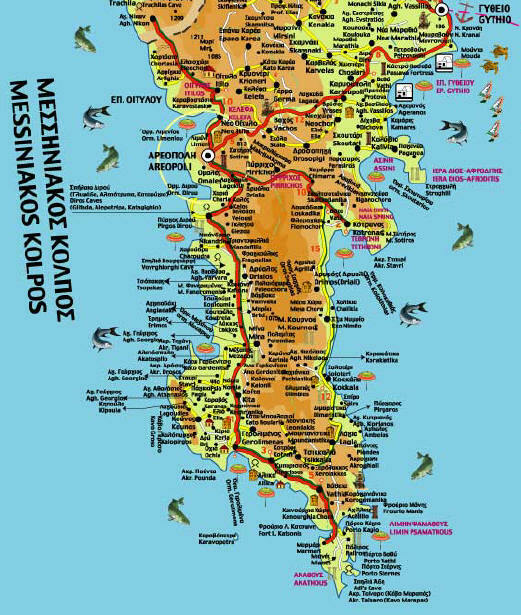 Small inns and a few hotels in the Areopoli area, back 20 km abound and the cost is under 100 Euros per night with breakfast for two. Tavernas still take in the days catch and the lambchops are meaty and hearty. No one goes hungry. Still the eyes’ of the Mani tell the story: even centuries of Moorish conquest attempts could not break that spirit. This is a land not to be forgotten. 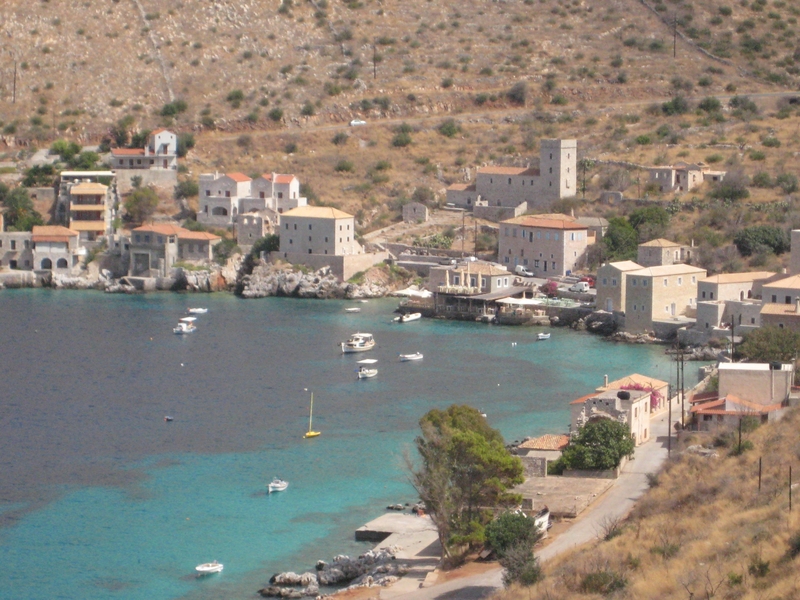 While tourist organized bus trips traverse this region in the Summer months, most do not make the trip to the point of the Mani pennisula. 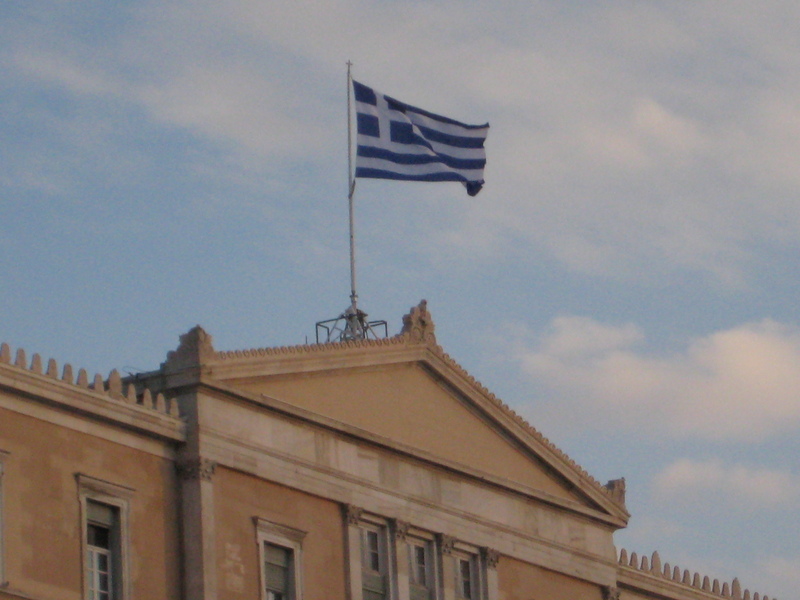 The drive to the region from Athens is about four hours. The drive is mixed amongst grid-lock traffic, beautiful three lane mountain highway toll roads and two lane mountain cliff switchbacks. The Aeropoli town region is very navigable. Limeni Village Hotel, 36 units, in the Limeni area, offers one of the great overnights with ample breakfast, pool, bar, and views of the sea. At 100 to 120 Euros for a double, you will be central to the best of the area. Mani is yet to be discovered, with exception of the caravaning European summer campers and bus tourists. But the word is getting out. R rated, with “ancient” scenes of the island and the Archaeological Site Akirotiki and the older traditional homes in Oia. Unfortunately Akrotiri excavation is closed, but if you want to see an archaeological site then you can visit Ancient Thera on Mesa Vouna mountain which is between Perissa and Kamari. There is a bus that shuttles people up and down which you catch in Kamari (although I have to say we have never done this). Ancient Thera is a switch back road of one lane up a mountain and then a view to die for(just down let the brakes slip on the way down). There is Minoan rubble and paths to scout. ( worth it)! There are numerous wineries to visit, we visited the wine museum (see link) http://www.santonet.gr/museums/winemuseum.html which I found really enjoyable. There is also Santo (really good whites) and Sigalas wineries amongst others. Now the Amoundi Beach I talked about is to the Left at the bottom of the Mule path steps. Go past the tavernas, up and over a ledge on a gravel path. Continue to the Rock bluffs and pick one ledge to spread towels on the edge of the Caldera. The Inky Blue sea goes down some hundreds of feet right here. Dive in and swim to the left side of the little island ( 80 yards) and find the steps to climb up to the White Greek Chapel on this little island. Wait for a CruiseLiner to pass and when the wake surge arrives jump into the sea. Nudist may find a spot here also. There is a long utility road down to the Amoundi port and some parking on the side of the road to save the knees on the 300 steps! Oia also has some great eating for dinner (Thalami taverna) . 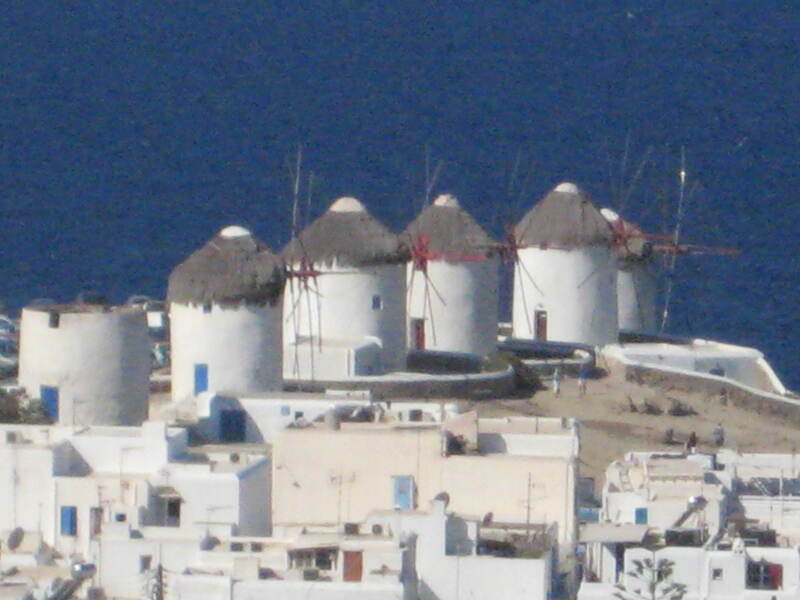 I also have discovered local Oia tavernas off the beaten path: There are two on the Finikia area down to the right to the plains below Oia: Anemelia Restaurant and another before it on the seaside at the bottom of the road down to the sea. Outdoor eating and the smell to the sea is to die for. Another is just before the entrance to Oia on the Main road, on the Right, called My Santorini. The Owner, Yanni, sings and plays Bouzouki. There are some pricey restaurants in Thira on the cliff edge, some not that great. Kamari Beach area has lots of tavernas and Pizza places along the “boardwalk”. All are at different price points, you must shop first. As for other restaurants/tavernas I have to say that as I stayed in Imerovigli, I just tended to eat there on a night or two. There is a taverna of great food and a value, family run, with my blessing: Taverna Imerovigli, Along the cliff before Firostefani, is a good Greek taverna with decent food if you ever wander into Imerovigli on foot on a night. 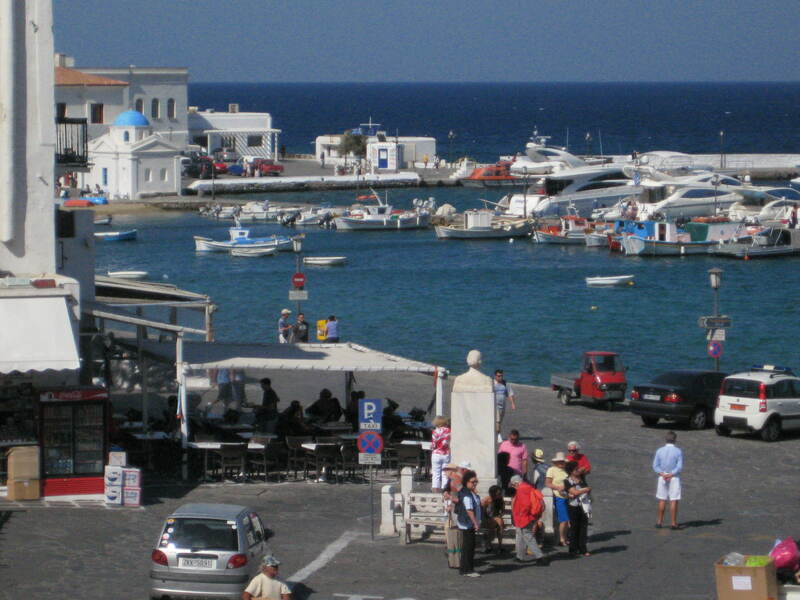 As for Fira town, there are dozens of places to eat. Some good ones are not on the cliff but on the street by the museum up the stairs from the street level “Stani” and Roof Garden and Dionysus.